This list was last updated on March 18, 2018. Every time my Mac runs slowly, I typically find myself doing the same things over and over again, all to get the speed to a point that I am satisfied with. 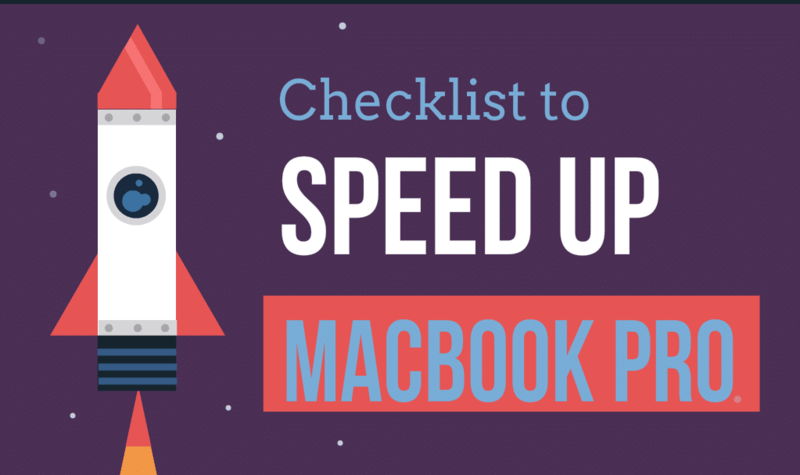 So, I figured it would be a good idea to write a checklist on how to speed up a MacBook Pro, and that’s what I’m going to show you in this article — a quick list that covers dozens of things you can do when it comes to improving your MacBook Pro’s performance. There’s one thing I want to state before you embark on your journey: there is no single tactic that magically works. For example, upgrading to SSD or adding extra RAM would help if you are using an old 2009 MacBook; if you are using a shiny new MacBook Pro with limited storage, you may find cleaning up the drive most useful. If you can do everything on this list (very unlikely though :-)), that’s great. If you want to skip some, that’s okay too. After all, the goal is to speed up your MacBook Pro by making the most of your time and investment. But in general, it’s close to impossible that you’ll be able to do all these things. Check off items as you go along. Not all of these may apply to your Mac. Have you restarted your Mac lately? Doing so on a regular basis helps clear system caches and shuts down applications, which often results in better performance. Slow startup? Check out this post for 6 simple guides. Most likely you’ll need to manage Login Items, remove some apps & services automatically launch on startup. Have you cleaned up your hard drive? It’s the best yet easiest way to speed up a Mac with an almost full hard drive. You can save time by using a tool like CleanMyMac 3. Have you really quit unneeded applications or services? Hint: clicking the red “X” button sometimes does not quit an application — it just closes the window. Right click and select “Quit”. Is “System Storage” (or “Other Storage”) taking too much disk space? macOS greyed out the section so you won’t be able to analyze further. However, you can use Dr. Cleaner (via Disk Map feature) to figure out detailed info and consider deleting some of the unnecessary system files. Does your MacBook lag all of a sudden? Open “Activity Monitor” to figure out the culprit (resource-hungry application or process) — and kill it. Check out this Apple article for more. Have you closed unneeded tabs and windows on Safari, Chrome or Firefox? This helps lighten your web browsers, thus making Internet surfing smooth. Have you disabled FileVault? Doing so usually resolves slow boot issues. Note: we do not recommend disable it if you think data encryption is more important than performance. Have you turned off visual effects? You may be impressed by the Magnification and Genie Effect, but the entertainment is a tradeoff for performance. Go to “System Preferences” -> “Dock” to change. Are you used to saving files and folders directly to Desktop? If so, clear off the desktop clutters as it could result in your MacBook Pro running sluggishly. Have you uninstalled third-party applications you don’t really use? You can quickly identify and remove them by Dr. Cleaner (via the App Manager feature). Have you emptied Trash on your MacBook Pro? It could help you free up much valuable disk space as well as ease your hard drive a little bit. Have you cleaned up web browser cookies, caches, histories, and plugins? Over time these files may take up gigabytes (GBs) and slow down your Mac. You can do so manually or by using CleanMyMac for efficiency. Have you removed duplicate files on your Mac? These days it’s easy for us to save multiple copies of those precious media items (photos, movies, songs, etc). Getting rid of them may release good amount of precious storage. You can use Gemini 2 to quickly locate and delete these duplicates. Have you removed unneeded Widgets from Dashboard? Those widgets can take up quite a bit of system memory (RAM). Learn how to do from this article. Have you disabled unneeded notifications? Constant notifications tax your system performance — plus, they are big distractions. This Apple support article shows how to turn them off. Have you removed unused system preference panes? They can take up some valuable system resources, and make it harder for you to find those you often use. Have you changed “New Finder windows” setting from “All My Files” to a specific folder? The new folder can be “Desktop” or “Documents”. This trick can speed up the generation of a new Finder window. Learn how to do here. Have you performed software updates for all Mac applications installed? An update tends to help you stay away from the application freezing issues. Have you tested your wireless network? Sometimes your Wi-Fi is the bottleneck rather than your MacBook. Read this MacWorld article and learn how to speed up Wi-Fi on your Mac. Is your MacBook Pro running the latest macOS version? Not only does a new version tends to be faster, it’s usually more secure and reliable. To date, the latest macOS version is High Sierra 10.13.3. Here are a few things you need to check before updating. Have you waited till Spotlight finish indexing? After a system upgrade, Spotlight indexing can take 24-48 hours. If you use your MacBook Pro during the time, it tends to be slow on everything. Have you fixed corrupted preferences files? A broken preference file can cause an application to run abnormally — e.g. unable to open, application crash/freezing. Have you reset SMC and/or NVRAM? This would help speed up your MacBook Pro’s overall performance, especially when there’s hardware (battery, keyboard, etc.) issues keep showing up. Have you tried to add extra memory (RAM)? This will help you run larger apps (e.g. video/photo editing) more smoothly. Crucial 16GB Kit and Corsair Apple Certified DDR3 are great options, though it depends on your Mac model, learn more from this article Best RAM for MacBook Pro we recently posted. Have you replaced your MacBook’s hard drive with a solid state drive (SSD)? Consider Samsung 860 EVO or Crucial MX300 (for general users), and Samsung 860 PRO (for power users). An SSD is much faster and more durable than a traditional HDD. Of course, it’s more expensive as well. You can learn more from our best SSD upgrade roundup. Let us know if you find this list helpful, or you have another awesome tip to add. Leave a comment below.